As one of Xerox’s affordable middle-weight B&W laser printers, the Xerox Phaser 3150 provides good resolution for graphics and crisp text for home or office use at decent print speeds. In less than 40 seconds, the Xerox Phaser is ready to print from a cold boot, chugging letter-size prints at 22 pages per minute. There’s an additional 10 second delay between print jobs and high-resolution printing. For a compact, this printer has some decent paper capacity. The 3150 comes standard with a 250-sheet cassette tray, capable of holding a half-ream of letter or legal-size paper. The tray has an adjustable rear lever to allow the 3150 to hold 11” x 14” legal-size paper, while maintaining the same footprint on your desk. There are other desktop laser printers with smaller footprints out there, but those printers often sacrifice having permanent legal-size paper support for desk space. The flip-door in front reveals a 50-sheet multi-purpose tray that can handle transparencies, labels, post cards, envelopes, 3” x 5” postcards up to 8.5” x 14” legal paper of various bond weights. Speaking of paper capacity, the little mechanical lever on the front of 3150 that indicates how much paper is in the tray is an easy, simple way to know when to refill at a glance. At 1200 x 1200 dpi resolution, the Phaser 3150 keeps text sharp--even at 6-point font sizes--and does a decent job with photographs in grayscale. To keep from consuming too much toner and to maximize print speeds up to 22 ppm, the Phaser offers 600 dpi resolution with a text-enhance or image-enhance switch. The Toner Save feature allows for a 40% toner life increase while keeping images clear and readable. This compact printer packs an impressive 32MB of memory. 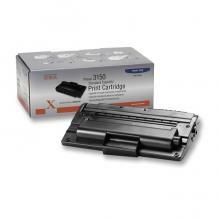 The 3150 can easily handle workloads from multiple print job requests. When connected to a workgroup computer, the printer can be shared by other computers in the same domain or workgroup. Xerox does offer an optional network adapter to make this a network printer. The Phaser has Parallel and USB connections. While PC’s with a parallel interface are becoming few and far between, it’s nice to free up a USB port if your computer still has a parallel port. You get that choice with the 3150. The USB also makes it easy to connect a laptop to the printer. 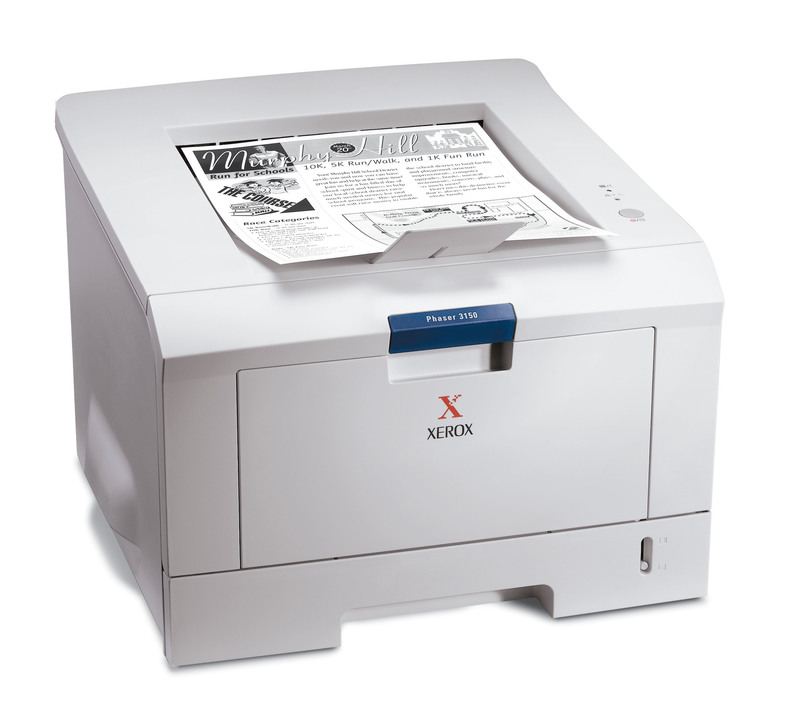 Understanding the printing needs of today’s businesses in providing support for the major software applications, Xerox has installed a set for print emulators that should satisfy the most diverse office. 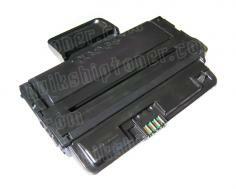 Emulators include HP PCL6, IBM ProPrinter, Samsung’s SPL and EPSON. The only emulator missing to make this a perfect set is PostScript. The printer produces 53dB of sound printing, while idling at 39 dB. To give you an idea of what that means: 60 decibels is the level of typical conversations and 40 decibels is the level of whispering. You probably don’t want to have this printer stationed in a conference room printing away when a meeting is in progress. But when placed in the copy room or in the middle of a busy office floor, the noise will blend in with the background noises. There’s a time to keep things simple, but having a single button to perform several different functions is just too much. If the Phaser had a multi-line display, I could see having the single-button-does-it-all. But the 3150 has just two LEDs for communication, so it’s like having to read Morse code (or POST code from BIOS). Hold the “Cancel” button once and it cancel’s the current job. Holding the button a half of a second longer will activate the Toner Saver. Hold it for 2 seconds to print a demo page. Hold it for 6 seconds and the 3150 prints a configuration page. Hold it for 10 seconds for the 3150 to run a cleaning mode (this should be done after every 500 printed pages). Then there are the various flash rates and colors by the LEDs that indicate various statuses and warnings. Review it: "Xerox Phaser 3150 "
The 3150’s toner and drum are integrated in a single cartridge, making it easy to maintain. The toner that comes with the printer only has a 3,500-page yield, but still enough to do a fair amount of printing while you order the 5,000-page standard size toner.